As a consumer you hold businesses to high standards and expect to receive honest and reliable goods or services. Not every company follows these same values, and you may someday find yourself needing legal help. 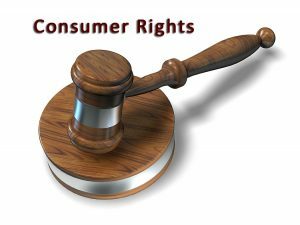 Consumer rights laws are in place to protect you as the buyer from false advertising, fraud, online scams, home foreclosures and more. Learn how more about consumer rights and how a consumer litigation legal team can help you protect your own. You’ve probably heard of the Federal Trade Commission (FTC), but did you know the commission works for your rights as a consumer? The Federal Trade Commission Act (FTCA) dates back to 1914 and is responsible for creating the FTC. The FTC works to protect consumers from unfair and fraudulent business practices. They enforce antitrust statutes and take in complaints from consumers about any violations or questionable practices. The FTC then investigates those complaints, files lawsuits, and creates rules designed to maintain the fairness of the marketplace. In an economy as strong as that of the United States, it isn’t uncommon to encounter fraudulent and deceptive business practices, products, and services. Some examples of this activity include telemarketing scams, faulty products, unfair advertising, and unsubstantiated claims. There are businesses that are built around scamming and deceiving customers, and the FTC works to put a stop to their practices. However, there may come a time when you unfortunately encounter one of these deceptive businesses. You may hire a contractor who skips town before completing a project in your home in its entirety. Or perhaps you purchase an appliance advertised as new only to discover it’s faulty and use when you bring it home. No matter the scenario you’ve fallen prey to, a consumer litigation team will work to protect your rights. Consumer litigation legal teams represent consumers who have been affected by unfair, deceptive, and/or fraudulent business practices. They investigate the matter for clients and pursue litigation to achieve the most favorable outcome for clients. Having a good consumer litigation team on your side can mean the difference between resolving a case fairly and writing it off as a loss. Akman & Associates, LLC provides effective consumer litigation representation and affordable legal services in the states of Maryland and Pennsylvania. If you’ve been wronged by harmful business practices, don’t go it alone. Connect with Akman & Associates, LLC today to discuss your options.